Here’s your chance to get your hands on the hottest new release from NITECORE — for FREE! That’s right. 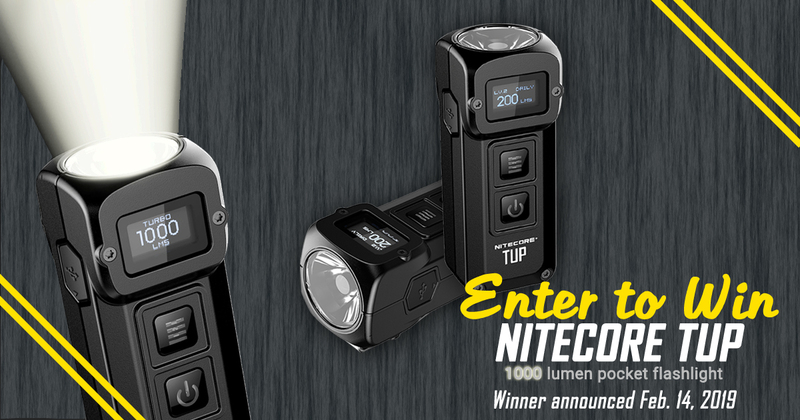 On February 14, 2019, we’ll be giving 1 lucky winner a NITECORE TUP in their color choice of black or grey. The TUP is a 1000 lumen, everyday carry pocket flashlight chock full of goodies including a digital display, deep pocket clip, and built-in USB charging. Powerfully compact, the TUP is here to revolutionize how you everyday carry. To enter, visit our online entry form and fill in your email address. Contest open to all U.S. residents over 18. Visit entry page for full contest details.